It's always pleasant to have a company change its privacy settings in a way that makes it easier for users to control their data. Yesterday, Facebook started rolling out easier-to-access privacy controls. A number of privacy controls - such as controlling who can see your content on Facebook - will be accessible with a single click to an icon on the right side of the top bar of Facebook. We are particularly pleased that Facebook is informing users about these controls with a notification at the top of the page after a user logs in. After so many years of controversy around Facebook privacy, it's heartening to see Facebook making privacy and control more accessible to users. 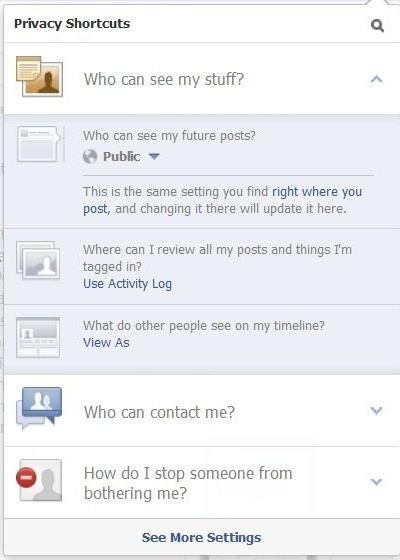 We hope this interface will inspire users to review the privacy settings of their content. We have concerns about the mail filtering options, but we'll be discussing that in a separate blog post. For now, we're glad to see Facebook ringing in the new year by making user control of content just a little easier. This notification informs users about the new one-click way to access privacy controls. These are the privacy options available to users who click on the icon in the top bar.